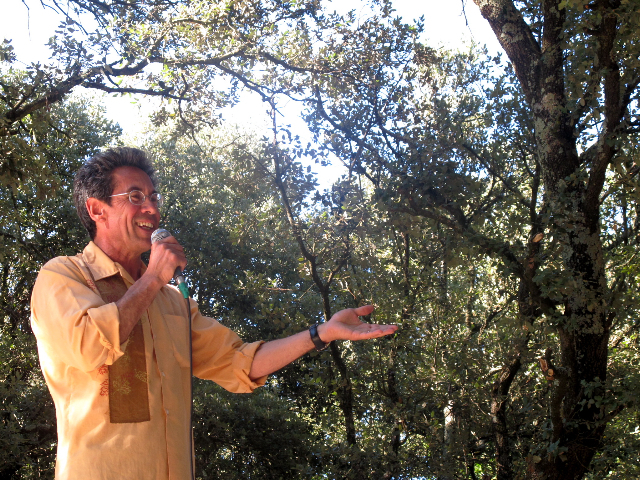 This was taken by my friend Luigi Rignanese (a great French storyteller) at a wonderful storytelling festival in Uzès, France, spring, 2011. Dan Yashinsky is a well-known Canadian storyteller, author, and community organizer. He received, in 1999, the first Jane Jacobs Prize to honour his contributions as a storyteller to enhance Toronto’s cultural life. He also received a 2009 Chalmers Arts Fellowship from the Ontario Arts Council. Dan founded the Toronto Festival of Storytelling (in 1979) and co-founded the Storytellers School of Toronto. He also began the longest-running open session in North America: 1,001 Friday Nights of Storytelling (in 1978). Dan has performed at festivals in Israel, Sweden, Norway, Holland, England, Wales, England, Germany, Brazil, Austria, France, the U.S., Singapore, and Ireland, as well as all across Canada. He is the editor of four acclaimed collections of Canadian storytelling (Next Teller – A Book of Canadian Storytelling; Ghostwise – A Book of Midnight Stories; At The Edge – A Book of Risky Stories; Tales for an Unknown City) and the author of Suddenly They Heard Footsteps – Storytelling for the Twenty-first Century (Knopf Canada), which won the 2007 Ann Izard Storytellers’ Choice Award. His book Swimming With Chaucer is coming out in fall, 2013, with Insomniac Press. Dan created and hosted Talking Stick, a CBC Radio One show that ran in the summer of 1999. He has been a storyteller-in-residence at Queen’s University, Toronto Public Library, The Stop Community Food Centre, Storytelling Toronto, and UNICEF Canada. Dan has done much to encourage the renaissance of storytelling in all parts of Canada. His work in schools has led him to create innovative curriculum projects, e.g. the Telling Bee and The Portage Project (part of Ontario 2000). Talking You In, a piece he created with composer/musician Brian Katz, has toured to the Barbican (London), National Arts Centre (Ottawa), and festivals in Wales, Holland, and Canada. They have performed it as part of staff training in hospitals in Wheeling (West Virginia), Pittsburgh, and Toronto. Dan has an M.A. in Sociology in Education from the University of Toronto, and a B.A. in Literature from the College of Creative Studies, University of California at Santa Barbara. I have listened to many of your stories on UTube. They are wonderful. I particularly like your story, “The Silent Prince”. I participate in a Medieval Re-Creation Group and would like your permission to tell that story to others. I am very new to stories telling and would also like to know on what stories you based “The Silent Prince”. Could you recommend other stories that would be appropriate for Medieval Story Telling? I am research folk tales but am wondering if you have any particular favorites. Mr. Yashinsky is a treasure of humanity. In a world shadowed by technology, Dan brings the grace and kindness of the goodness of our species to build bridges between all people. dan yashisky is an absolute gem . as a outpatient at the baycrest intoronto I had the great pleasure tomeet and talk to him and listento .I think his oncea ek stories were the main reason for my recovery .ihave never met a more charismatic , person . a bight star in my opinion.his personality is of a man enjoying his prroffesion and imparting his wonderful personality to everyone.iam a retired physician and honestly never met anyone that made me feel so at ease with the first meeting.i did know he was such a well known person.his memory is beyond comparison. in short I absolutely looked forward to his weekly hour at the baycrest. he has no ego and treats everyone with great courtesy. he was the best to make me recover after my surgery.i saw him a fewdays ago at the baycrest . he greeted me such joy just seeing and talking to him was wonderful he was just like an old frend as I said he is the best medicin that you could ever hope for.in short a gem more people wood benefit from.i hope he is able to give his storie telling for a long time he was an instant inspiration to me . I thank him for ever . Where’s my watermelon? Much promised, much anticipated!